The most effective juicing cleanse is when you carry them out regularly. Think of it like you would visiting your dentist or getting the car serviced. A cleanse or detox is a way to give your organs a clean out. It enables key organs like the liver to catch up and repair itself. Our hectic modern lifestyles can take their toll on our bodies, we work hard, play hard and have lots of tempting junk food pass our way. Carrying out a cleanse is a great way to just step back, take some time to give our body a break, let organs like the liver repair themselves and flush out all those nasty toxin which build up in our bodies. Carrying out a juicing cleanse doesn’t have to be a big deal you don’t have to spend days preparing or lots of money on it. It doesn’t involve a trip to an expensive health clinic, (unless you want to) it can all be easily and cheaply carried out at home. It’s often a good idea to do a cleanse over a weekend or when you’ve got some time off work. That way you’ll be able to change your normal routine and not let tempting treats like biscuits and cakes set you off course. It should also mean that you’ll have time to relax and take it easy. 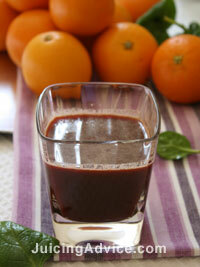 Juicing is a perfect DIY tool for use during a cleanse. All you need is your juicer and a selection of fresh fruit and vegetables. 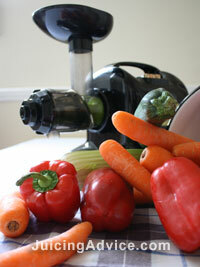 In this photo you can see my juicer, ready to get juicing all those lovely vegetables. A juicing cleanse allows a substantial amount of fluids into your body, an essential part of any cleanse. These fluids are what help to flush out your organs and in the process removing toxins that have built up over time. You can also use different types of fruit and vegetables to target your own individual needs. Giving you the opportunity to produce a personal cleanse programme. You can find out more information about the different types of fruit and vegetables and their cleansing properties on our juicing for detox page. Many people report that a juicing cleanse helps them feel so much better, their hair shines and their skin glows and overall gives them a feeling of wellbeing. However please be patient, many people say that they start off feeling worse than when they started this is particularly when you start a cleanse programme. The skill is to expect this and stay focused on the benefits and concentrate on how you will feel better. After all the initial horrible feeling is your bodies way of telling you that it’s removing those nasty toxins that have been sitting in your body for too long. Check out our juicing detox recipes page for some of my favourite recipes.